MEMBERS of the three disciplined forces will use the re-furbished Joint Services College in Lae for cadet training. Police Commissioner Gari Baki, Correctional Services Commissioner Michael Waipo and Defence Force commander Brigadier-General Gilbert Toropo all attended the institution 42, 39 and 33 years ago respectively. Waipo said cadets would be trained at the college to become future leaders of the State organisations. He said some officers in the CS had never attended such training programmes. “I am proud that the college has been resurrected and the officers will have the opportunity to go through modern programmes that will enable them to have a professional qualification to be good leaders,” Waipo said. He said the first batch of cadets consisted of six men and two women. 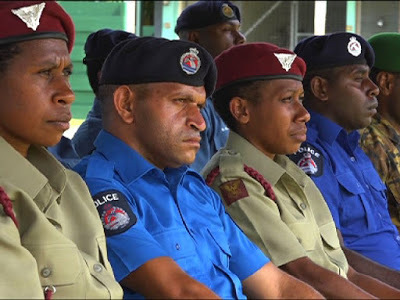 Waipo said the programme would strengthen networking with the police and Defence Force. “This is a good place to strengthen that level of collaboration,” Waipo said. Baki agreed that the college would allow interaction between the leaders of the three disciplined forces. “Through the college, we will understand the language we speak, understand the issues of command and issues of discipline which we deal with at that level,” Baki said. Toropo said the outcome from the college would benefit the leadership and command of the disciplined forces.